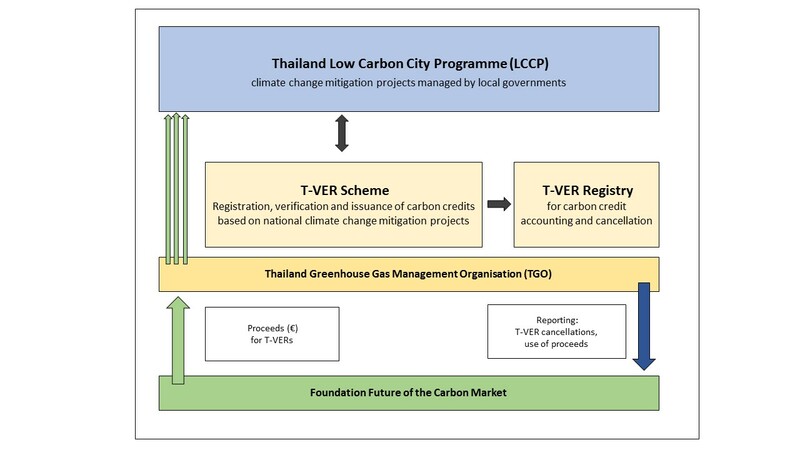 In January 2019, the Foundation has signed a Terms and Conditions for cooperation with the Thailand Greenhouse Gas Management Organization (Public Organization) or “TGO” regarding the support of the Thailand Low Carbon Cities Programme (LCCP) through a results-based payment mechanism, aiming at the generation and subsequent cancellation of up to 225,000 emission reductions – so-called TVERs – from mutually agreed project activities. The LCCP has been developed by the Thai Government with partial support from the World Bank’s Partnership for Market Readiness. The Low Carbon Cities Programme is linked to a voluntary carbon emission reduction scheme, the so-called T-VER Scheme. This climate policy instrument has been developed by TGO building on its expertise with the Clean Development Mechanism (CDM), following similar – but simplified – methodologies and processes for the development, registration, verification and carbon credit issuance of climate change mitigation projects. •	Refuse-derived fuel installations, substituting coal by pre-treated municipal solid waste in cement plants. It is expected that the T-VER Programme will be linked to a potential national emission trading scheme (ETS) over the mid- to longer term through the provision of carbon offset credits demanded by national ETS participants. Through the cooperation, the Foundation acts as a first international buyer of TVERs, aiming at strengthening the national T-VER Scheme through demand raising, acting as an incentive for cities and communities to engage in climate change mitigation projects under the LCCP, building capacities for national and local authorities and – as frontrunner – providing an example to other potential international buyers. Under its cooperation with the Foundation, TGO will regularly report on the progress of the programme and aims to complete the cancellation of the targeted volume of emission reductions by October 2021. Figure: Visual description of the cooperation between TGO and the Foundation (ZdK, 2019).